The MK60 ATE Teves ABS pump is fitted to a wide variety of vehicles from all makes of manufacture and includes the Suzuki group vehicles. 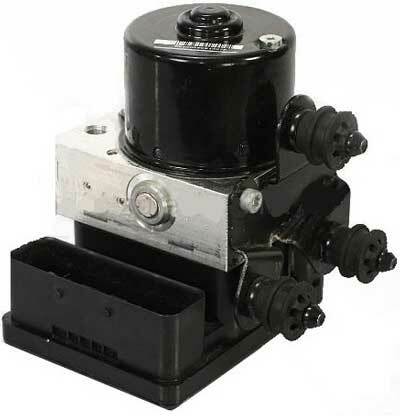 This type of ABS pump has an internal brake pressure sensor manufactured inside the unit is commonly known for it’s pressure sensor fault and is very expensive to replace. Earlier ABS pumps never had this fault because the pressure sensor was never before fitted inside the ABS pump – but these new type of ABS units are failing all day long and it’s a major design fault with all internal pressure sensor units. When the pressure sensor has failed on the Suzuki ABS system, the traction control light will be illuminated and sometimes the ABS light as well. The traction control (ESP) button may also be illuminated and pressing the button will have no affect. C1028 – Brake pressure Sensor Circuit defective. – Present. Below we have compiled a short list of vehicles we have found fitted with the MK60 ATE ABS pump from our own experiences of units being sent in to our workshops on a daily basis for rebuilds and exchange. Below are the most common part numbers coming in every day to our workshop. We receive 100’s of units from all makes of vehicles each week for repair and replacement so don’t worry if your part number is not listed. If your Suzuki has the dreaded Brake Pressure Sensor fault then you probably already have had a scary quote from a dealer of £1200+. Even second hand used parts are not cheap and require additional coding / programming. Neither of these options are recommended because it doesn’t fix the root cause of the problem and you will be just waiting on the day for it to fail again. My Brake Pressure Sensor Has Fail – How Can SINSPEED Help Me? Instead of just replacing the unit with a like-for-like part or repairing the ABS with a standard like-for-like pressure sensor as most workshops are currently offering. Sinspeed will take your unit and modify it to ensure never again over heats and then replace the pressure sensor with an uprated component. The uprated pressure sensor is guaranteed to last the lifetime of the vehicle and all components used by Sinspeed during the remanufacturing process are brand new OEM quality parts to ensure that each & every rebuilt ABS pump meets and exceeds OE specifications. All of our rebuilt ABS units come with a Lifetime warranty and will not require programming. Our ABS pumps are self calibrating – making them fully plug & play! All cars prior to the MK60 ATE ABS unit had the pressure sensor fitted externally and never failed. If we fit a standard part inside the pump it will still have the design fault it was manufactured with and although we can put a warranty on the unit and replace the sensor each time it fails (because they are cheap as chips to buy) you will still be left inconvenienced by having to remove the unit each time it fails and pay for the labour each time. We rework the original design and ensure that our modified units are rebuilt to last. There have been rumours of people and/or companies trying to repair these units and in some cases imitate our work. Please understand that although the ESP system is not absolutely crucial, modifying the ABS controller / pump in any way (without superior extensive knowledge) in the technology of advanced braking systems and electronic control modules, you will be risking the life of others. Please do not attempt to repair these units yourself and please do not offer such services to trade or the general public. We have been in business since 1972 as a group company and all our parts, services are fully tested before leaving the workshop. All units are thoroughly tested on specific specialist equipment to ensure maximum quality. Our ESP Fault Modifications come fully approved and as far as we’re aware, there is no other company out there that can successfully repair these units and completely remove the defective state. If you have a vehicle with the Brake Pressure Sensor ESP Fault then give us a call on 0844 847 9999. Tags : 000403296D1, 06210208854, 06210952003, Suzuki Brake Pressure Sensor Problems, Suzuki C1028 Pressure Sensor Fault Code. Abs gone on my Suzuki swift. Got a replacement part from breaker before being told about Decoding . It’s from a suzuki splash 2008 1.3 model. bEILEVE WE NEED THIS UNIT REPLACED, OR FIXED, CAN YOU GIVE US QUOATION, AND DO WE REMOVE AND SEND YOU ITEM? THANK YOU. hi, I have a 2005 suzuki swift with an abs issue. Parte number 062102-03854/62J0. there is no oil leak, but the brakes/abs do not work when heavy braking. We are aware of this type of fault, it’s quite common and one we are able to test & repair. I have sent you an email with full information and pricing. If you have any questions, please reply to the email and we’ll be happy to assist you. It’s an extremely common fault to have but we always recommend having the fault diagnosed on the vehicle before considering to send the ABS unit to us. If your local garage plugs into the vehicle and retrieves a fault code relating to the brake pressure sensor, or another fault relating to the ABS pump/module failure, then we can definitely help. We have the facilities to fully bench test the unit in an isolated environment to confirm whether it is faulty. All remanufactured units are returned with a lifetime warranty and will not require reprogramming when installing back to the vehicle. I have sent you an email with full information and pricing for the 2008 Suzuki Swift Sport ABS pump.